Welcome to the four hundred and sixty-third of my blog interviews with novelists, poets, short story authors, biographers, agents, publishers and more. Today’s is with novelist, short story, playwright and non-fiction author Elise Warner. A list of interviewees (blogged and scheduled) can be found here. If you like what you read, please do go and investigate further. Morgen: Hello, Elise. Please tell us something about yourself, where you’re based, and how you came to be a writer. Elise: Hello Morgen. I’m a born and bred New York City girl who listened and was entranced by the stories my mother told me on rainy days. Mom added drama and excitement to the stories she told and that influenced me. Reading became a great love early in my life and that lead to writing. Morgen: How wonderful, I hope your mum wrote the stories down. 🙂 What genre do you write? Elise: My debut novel is Scene Stealer, my Cozy Mystery; the novel I’ve just completed and hope to have published, is Mainstream and Women’s Fiction. My short stories run the gamut and I’ve had quite a few non-fiction articles published. Morgen: I write a bit of everything (like you, mostly short stories) and love the variety. Do you write under a pseudonym? Elise: I write under Elise Warner—the name I used when I was a performer. Morgen: It’s a great name. Have you had any rejections? If so, how do you deal with them? Elise: I’ve never met anyone who hasn’t been rejected sometime during their career. I put the piece aside for about a week then take another look to see if I agree if there are comments then either rewrite or send the story, article or book out again. Morgen: It’s the best way to deal with them. I’ve had a few authors say they’ve had no rejections but usually because they write / submit very little or they’ve had everything picked up. 🙂 Have you won or been shortlisted in any competitions? Elise: I won the American Kennel Club Award in 2008 for a short story titled Stage Door Johnny about a dog and children touring with a show. Theatre Guinevere presented me with a Guinny for a play titled Small Time about vaudevillians. Morgen: They sound great. Do you have an agent? Do you think they’re vital to an author’s success? Elise: Don’t have an agent. I think if you can connect with an agent who truly believes in you it would be a step up for a writer. Morgen: I think so too, although it’s not worked out that way for some of the authors I’ve spoken to, but then the agents may not have truly believed in them. Are your books available as eBooks? Were you involved in that process at all? Do you read eBooks or is it paper all the way? Elise: Scene Stealer is published as an eBook by Carina Press, the digital division of Harlequin and is available at Barnes and Noble, Amazon, Carina Press and wherever eBooks are sold. I bought an eBook reader because of my book and thoroughly enjoy reading books on it. The light is marvellous and you can change the fonts but I also read paper—the advantage is you can pass something you love to a friend you believe would love the book too. Morgen: Some people do both; love the eBook so much they buy the paperback so they have it. How much of the marketing do you do for your published works or indeed for yourself as a ‘brand’? Elise: Learning the tech aspects of social media to market my book was difficult for me. I had used my computer as a word processor, email and research suddenly I had to learn to blog, request interviews, join Facebook, Twitter, Linkedin, and Tumblr. I’m still working on my website. Thank goodness for several Carina authors published at about the same time who were most generous with their help. Morgen: That’s the downside to online marketing (I think we’re all still learning) but the great thing about the writing fraternity; that they’re so willing to help. I equate it to learner drivers, we all know how hard it is to ‘pass’. Do you have a favourite of your books or characters? If any of your books were made into films, who would you have as the leading actor/s? Elise: Miss Augusta Weidenmaier, my amateur detective in Scene Stealer. I would love to have Maggie Smith portray her. Would she be willing to play an American? Morgen: She’s brilliant. I’m sure she would. Did you have any say in the title / cover of your books? How important do you think they are? 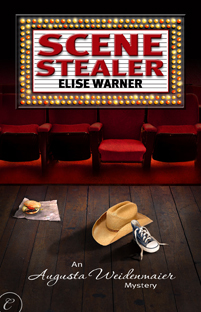 Elise: My title was used and I was asked to describe how I would see the cover of Scene Stealer. I love the cover the artist gave me and I couldn’t ask for one that better fitted my concept. I think a cover is extremely important. Morgen: It is great. What are you working on at the moment / next? Elise: I’m about to send a new novel, along with a prayer, to publishers. Cross your fingers for me, toes as well if they’re long enough. I shall then begin another Augusta Weidenmaier mystery. Morgen: I love that you say you send a prayer too. I’ve spoken to a few well-known authors who still get nervous when they submit. Do you manage to write every day? Do you ever suffer from writer’s block? Elise: I do write every day. I’m most productive in the mornings but if for some reason I can’t work then, I sit down at my computer later in the day. If I’m stuck, I try to think about the difficulty just before I go to sleep and often it helps. Morgen: I think it was PD James (I may be wrong) who says she goes to bed with a sentence half-done if she’s stuck then finds it easier to carry on in the morning. Do you plot your stories or do you just get an idea and run with it? Elise: Most of the time, I run with it. The characters do step in and help. Morgen: Don’t they just, I love that. Do you have a method for creating your characters, their names and what do you think makes them believable? Elise: They’re generally based on characteristics and quirks of people I’ve met in the past then they acquire their own qualities. Morgen: You’ve mentioned short stories and non-fiction but do you write any poetry? Elise: Wrote a rhyme or two in the past. One was published in a mystery magazine but I couldn’t call it poetry. Morgen: 🙂 I dabble but I say I don’t really ‘get it’. Tell us a bit more about your non-fiction and short stories? Elise: Both—I have two short stories waiting to be submitted right now and I write a lot of non-fiction articles. Love early American history and I realized I’ve written and published three completely different articles on my favourite dessert—ice cream. Morgen: 🙂 History was my worst subject at school but ice cream I could write about. Do you do a lot of editing or do you find that as time goes on your writing is more fully-formed? Elise: Lots and lots of editing in non-fiction, not as much in fiction. Morgen: That’s interesting. Do you have to do much research? Elise: Yes. I like to make details as accurate as possible and I enjoy research. Morgen: I love having the internet kind of research. What point of view do you find most to your liking: first person or third person? Have you ever tried second person? Elise: First person for my books. Have you used all three in short stories and primarily third in articles, depending on what the guidelines for the publication states in their guidelines. Morgen: You’ll have to tell me how you got on with the second person ones. Do you have pieces of work that you think will never see light of day? Elise: I have one about the history of sneakers and have had good comments on but no sale. It’s dated now. Morgen: I’m sure there’d be a home on it somewhere if it was updated, certainly online. What’s your favourite / least favourite aspect of your writing life? Has anything surprised you? Elise: The way writing can take you away from the distressing moments of life. Surprise—I wish I had begun writing earlier in life. Next life, I shall try to write the Great American Novel. Morgen: It’s never too late. This coming Sunday’s interviewee is 91. 🙂 What advice would you give aspiring writers? Elise: Pick up that pad and pencil or sit down at your computer and begin. Elise: Edna Ferber, Jane Austin, John Galsworthy. Spicy chicken thighs, my mother-in-law’s baked macaroni and for dessert, ice cream. Morgen: Had to be ice cream! (I’m hooked on Ben & Jerry’s Cherry Garcia – have it almost every time I go to the cinema). Is there a word, phrase or quote you like? Elise: I love the theatre and it was a big part of my past. Morgen: I’d love to hear more about that, perhaps as a guest blog or author spotlight? Are there any writing-related websites and/or books that you find useful? Elise: Not Your Usual Suspects—A group of mystery writers from Carina Press. Strunk and White’s book The Elements of Style, Anne Lamott’s bird by bird, and Stephen King’s On Writing. Morgen: Bird by Bird’s been recommended a few times so I bought it the other day. Not read it yet (like most of my books) but I look forward to it. Are you on any forums or networking sites? If so, how valuable do you find them? Elise: Facebook, twitter, linkedin, tumblr. Places where we can learn from other writers are valuable to me. Elise: People have always told and listened to stories. There will always be a place for writers. Morgen: I agree. Where can we find out about you and your work? Elise: My blog: www.elisewarner.blogspot.com, www.amazon.com/scenestealer-ebook/dp/B003NX7BSA, http://www.barnesandnoble.com/c/elise-warner, www.carinapress.com, www.Goodreads.com/Elise_Warner, www.twitter.com/elisewarner and www.Facebook.com/elisewarnerb. Morgen: Wow. Is there anything else you’d like to mention? Elise: Morgen, I’ve enjoyed the interview. Thank you for inviting me. Morgen: You’re very welcome. Thank you for taking part. Such a darling boy; why did he seem familiar? Of course! The child was the spitting image of that little tyke in the Cowboy Bob’s Big, Bad Burger commercial. The commercial where the boy, dressed in chaps and a ten-gallon hat, twirls a rope and dances a hoedown with animated French-fried potatoes. Big blue eyes and a warm smile people returned. But this adorable child wasn’t smiling. The train stopped at several more stations. Where were we? I couldn’t see a thing with that portly gentleman standing directly in front of me. I craned my neck to see around him but garish sprays of graffiti obscured the sign indicating the station; I could barely decipher the lettering. This stop was Columbus Circle; the next would be Lincoln Center. Folding my unread magazine, I clutched my purse and umbrella and murmured, “Excuse me. Pardon me,” over and over again as I tried to make my way through the throng. I managed to reach the door just as the train announced its arrival at the 66th Street station with a nerve-jangling screech. Two extremely rude teenagers blocked the door. One was lost in the cacophony of sound that leaked from his oversized earphones. The other was engrossed in paring his fingernails. A gentle thrust with the tip of my umbrella and I was able to make my exit. The child and his companion were about fifteen feet ahead of me. When the boy looked back, I thought I could see his lower lip tremble. Impossible, he was too far away and my vision, though I hate to admit it, is not what it used to be. The man placed his hand on the child’s shoulder; they picked up their pace, reached the stairway and melted into the crowd. Was it the young actor who performed in the commercial or was it someone who looked very much like him? And why wasn’t he attending class this morning? Today was Tuesday, a school day. The traffic light turned yellow, then green. Car horns blasted the air with impatience. I checked to see if the vehicles flowing past would obey the signal, since at my age the body slows a bit, and was about to step off the curb, when the little boy tugged at the sleeve of my jacket. I never heard his answer. There was a sharp poke in the small of my back and the next thing I knew I lay sprawled flat in the gutter. 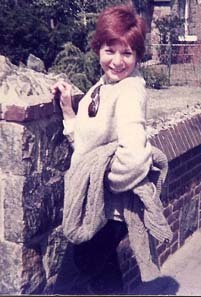 Elise Warner has written short stories for magazines such Mystery Time, RTP, Futures and Citywriters in addition to non-fiction for newspapers and magazines such as The Washington Post and the American Spirit, International Living, Rock & Gem and Gold Prospector, the European and Time Travel Britain. A story about a musical troupe touring with dogs was included in the Anthology Good Dogs Doing Good and a mystery The Tree House was published in the 2010 Deadly Ink Anthology. Stage Door Johnny, won second prize in an American Kennel Club Magazine contest. Her debut novel, Scene Stealer, a cozy mystery featuring Miss Augusta Weidenmaier, was published as an eBook by Carina Press, and is available wherever eBooks are sold—an audio version was produced and is available at www.audible.com. What a delightfully compelling writing sample – loved it! I’ve just stumbled across your site. Thanks for quality interviewing skills. I must follow you and your guest. And a Thank you to you, Nancy and to Morgen for inviting me to her site. I loved SCENE STEALER and love Elise. I highly recommend her book. Glad you agree, Toni. any Motion Picture Producers out there? Thanks for for the “like,” Lesley. Visited you blog. Love travel.